Samruddhi Sky in Naroda, Ahmedabad City & East by Samruddhi Corporation Ahmedabad is a residential project. The size of the APARTMENT ranges in between 1620 sq.ft. and 1695 sq.ft. 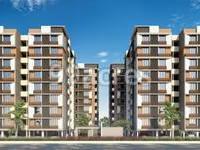 Samruddhi Sky offers facilities such as Lift.It is a Gated society. This is a RERA registered project with registration number PR/GJ/AHMEDABAD/AHMEDABADCITY/AUDA/MAA01160/A1. It is an under construction project with possession offered in Jan 2022. The project is spread over a total area of 1.74 acres of land. It has 54% of open space. Samruddhi Sky has a total of 4 towers. The construction is of 7 floors. An accommodation of 112 units has been provided. 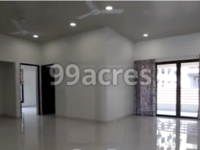 You can find Samruddhi Sky price list on 99acres.com. 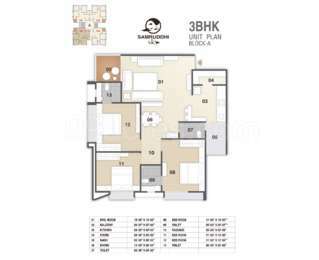 Samruddhi Sky brochure is also available for easy reference. The real estate market of Ahmedabad City & East is on a positive trajectory. This beautiful city appeals to homebuyerÃ¢? ?s interest and hence witnesses demands. To meet these, the developers in the city are coming up with new developments. Proximity from commercial hubs and easy connectivity are two major factors that add to the positivity of the realty market. Presence of excellent healthcare facilities and good educational institutions also add to this positivity. In which area is Samruddhi Sky located?The project is situated in Naroda, Ahmedabad City & East. 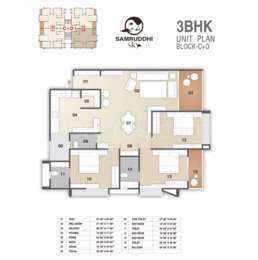 What is the area of apartments in Samruddhi Sky? The area of apartments offered in the project ranges from 2205.0 sqft to 2430.0 sqft. What is the area of Samruddhi Sky?The total area that the project occupies is 1.74 Acres. What is the construction status of Samruddhi Sky?The expected date of project handover is Jan 2022. How many units are there in Samruddhi Sky?The project offers a total of 112 units.